ONLINE fashion marketplace Zalora, having amassed US$238 million in investment funds since its founding in 2012, looks set to be among the players leading the US$21.8-billion South-east Asian e-commerce market to new heights. In the past month alone, the Rocket Internet-backed, Singapore-based start-up has unveiled several breakthrough initiatives in e-commerce. The latest, an online shopping event showcasing its Chinese New Year collection, will be held on Jan 16 via video-chat platform Google Hangouts. 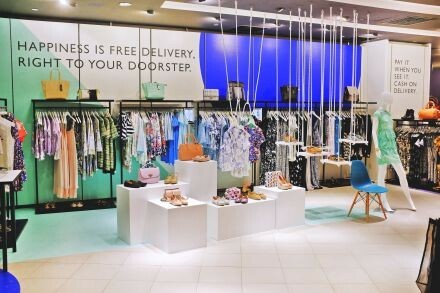 Shoppers can discover and purchase apparel while "hanging out" and interacting with the Zalora community, in what is believed to the first such experience in South-east Asia. Organised under Google India's Great Online Shopping Festival, the "hangout" will be hosted from Zalora's pop-up store in ION Orchard. The start-up also recently launched gift cards - like those popularised by Amazon and iTunes - at some 70 Cheers convenience stores around Singapore; it claims to be the first fashion-oriented e-commerce player in the region to do so. The gift cards, available in S$30, S$50 and S$100 denominations, are set to be sold throughout South-east Asia later this year. Another pioneering move by Zalora last month was 12.12 Online Fever, an online shopping event that it described as South-east Asia's answer to Cyber Monday in the US and Singles Day among young Chinese. It had partnered more than 100 e-commerce players, ranging from banks and airlines to telcos and restaurants, across South-east Asia and Hong Kong to create a one-stop portal offering the best promotions to shoppers on Dec 12. Dione Song, marketing director for Zalora Singapore, told The Business Times: "The event was a united effort to promote e-commerce and grow the entire ecosystem in the region . . . and to foster consumer confidence in online transactions." Operational support from logistics partners such as SingPost and 7-Eleven convenience stores enabled consumers to enjoy convenient pick-up and return options, and so come to better appreciate the ease of online shopping, she added. Aside from industry partners and merchants, Zalora has also garnered support from Singapore's Economic Development Board (EDB), which last year pledged to drive e-commerce among Singapore companies by investing in building a local talent pipeline to address the current talent crunch and emerging needs of this burgeoning sector. Kiren Kumar, infocomms and media director at EDB, said: "Our vision is for Singapore to be the regional hub for brands, and for retailers to access the growing South-east Asian consumer market through e-commerce." And Singapore is well-positioned to capture this opportunity, he added, given its vibrant ecosystem of sophisticated partners such as Zalora, which has shown its commitment to develop the e-commerce industry, and its robust information technology (IT) infrastructure. The Republic's high Internet penetration rates and strong credit card usage also reflect a tech-inclined pool of consumers with the knowledge and propensity to shop online, said Zalora's Ms Song. "The retail pie is not a zero sum game; e-commerce provides more avenues for transaction and more convenience to shoppers. Naturally, as more shoppers start going online, traditional retailers will feel the pressure to become more active on social media and to have their brands online." Challenges notwithstanding, she added, there will be big opportunities for the region to innovate and strengthen its logistics and Internet infrastructure to support e-commerce.